DVD to PSP Converter and PSP Video Converter. iMacsoft DVD to PSP Suite is a professional DVD to PSP converter and PSP Video converter suite designed just for Windows PSP users who want to enjoy their DVD and video files on PSP and PS3. iMacsoft DVD to PSP Suite includes two professional products: iMacsoft DVD to PSP Converter and iMacsoft PSP Video Converter. iMacsoft DVD to PSP Converter is powerful and easy-to-use DVD to PSP converter and DVD to PS3 converter software, which can not only convert DVD to PSP MP4, PSP H.264/MPEG-4 AVC, PS3 MPEG-4, PS3 H.264/MPEG-4 AVC High-Definition (480P,720P and 1080P) Video formats, but can also extract audio track from DVD to MP3, AAC audio formats with high sound and image quality. iMacsoft PSP Video Converter is a powerful PSP Video converter, which can convert all popular video formats to PSP and PS3. It can convert video to PSP MP4 video, PSP H.264/AVC video, PS3 video MPEG-4 (480p, 720p, 1080P) and extract audio from video to MP3 and M4A. Free download iMacsoft DVD to PSP Suite and enjoy your DVD and video files on your PSP and PS3! iMacsoft DVD to PSP Converter can rip and convert DVD to PSP MP4, PSP H.264/MPEG-4 AVC, PS3 MPEG-4, PS3 H.264/MPEG-4 AVC High-Definition(480P,720P and 1080P) video formats and extract audio track from DVD to PSP MP3, AAC audio formats with high sound and image quality. iMacsoft PSP Video Converter can convert video formats including AVI, MPEG, WMV, DivX, MOV, RM, DAT, VOB, 3GP to PSP MPEG-4, PSP AVC, PS3 MPEG-4 (480p, 720p, 1080p) video formats and can also convert audio formats like WMA, WAV, M4A, AAC, AC3, OGG to PSP and PS3 music MP3, AAC, M4A with perfect audio quality and high conversion speed. Rip and convert video and audio from any DVD movies and all popular videos for playback on your PSP, PS3, PSP 3000, Sony Walkman, Sony XPERIA X1a, Sony XPERIA X1i/X1c, etc. iMacsoft PSP Video Converter allows users to choose start point and duration at will. iMacsoft PSP Video Converter lets you edit the output MP3, WMA ID3 tag info including author, album, genre, etc. in profile settings panel. 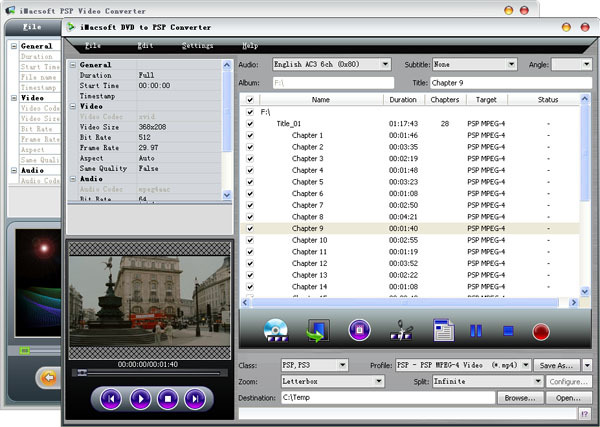 iMacsoft PSP Video Converter and DVD to PSP Converter allow you to preview DVD or input video files before conversion. iMacsoft PSP Video Converter allows you to easily check the parameters of the source files including bit rate, frame rate, duration, sample rate, channels, etc. to make video conversion more convenient. iMacsoft DVD to PSP Converter supports various functions which allow you to trim video, customize and split output file size, rip DVD's any titles and chapters, select subtitle and audio track, set bitrate, resolution, and frame rate, etc. iMacsoft PSP Video Converter is a powerful PSP Video converter, which can convert all popular video formats to PSP and PS3. It can convert video to PSP MP4 video, PSP H.264/AVC video, PS3 video MPEG-4 (480p, 720p, 1080i) and extract audio from video to MP3 and M4A.